24048 Private Watkin Smith, 9th Battalion, the Lancashire Fusiliers was killed in action 19 September 1916 and is commemorated on the Thiepval Memorial, France. To date, a local commemoration to him has not been traced. Unable to trace Watkin Smith but apparently he was born in Evenwood. 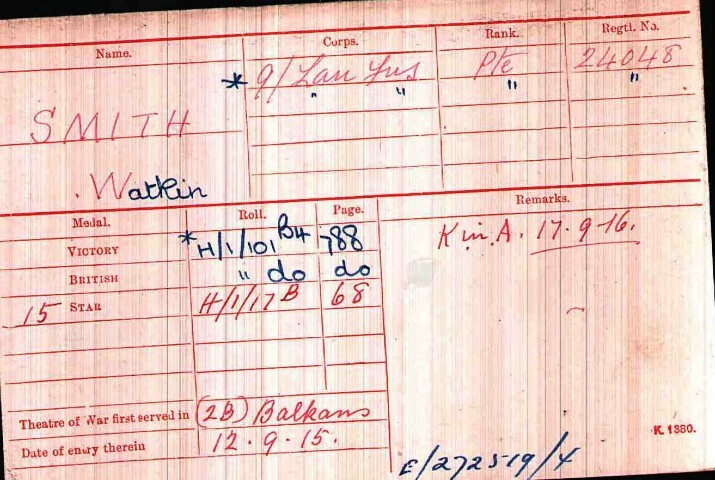 The service record of Private Watkin Smith has not been researched so the exact date he enlisted is unknown. He enlisted at York but lived at Forest Hall, Newcastle upon Tyne at the time. He had served with the 5th Cavalry Reserve, service number 15067 prior to being posted to the Lancashire Fusiliers. He joined the 9th Battalion, the Lancashire Fusiliers and was given the regimental number 24048. He may have been a Reservist and at the outbreak of war, enlisted into the Lancashire Fusiliers. 1 July 1915: The Division sailed from Liverpool and via Alexandra and Mudros. 21 December 1915: The Division withdrew from Gallipoli. July 1916: the Division landed at Marseilles, France and spent the rest of the war on the Western Front being introduced to the Battle of the Somme at the Battle of Flers-Courcelette. 15 September: The Battle of Flers-Courcelette commenced and is notable for the introduction of tanks. This offensive employed 12 Divisions and 49 tanks. They proved notoriously unreliable and only 15 rolled onto No Man’s Land at the start of the attack. The BEF and Canadian Corps made initial gains of some 2 kilometres within the first 3 days including the capture of the ruined villages of Martinpuich, Flers and Courcelette and much of the sought after High Wood. However a combination of poor weather and extensive German reinforcements halted the advance and the Allies again suffered high casualties. The 11th Division formed part of the II Corps together with the 18th Division alongside the Canadian Corps (1st and 2nd Canadian Divisions). The Division was also involved in offensive action that followed at Thiepval Ridge. The II Corps occupied positions to the north of the offensive line, to the immediate south of Thiepval. 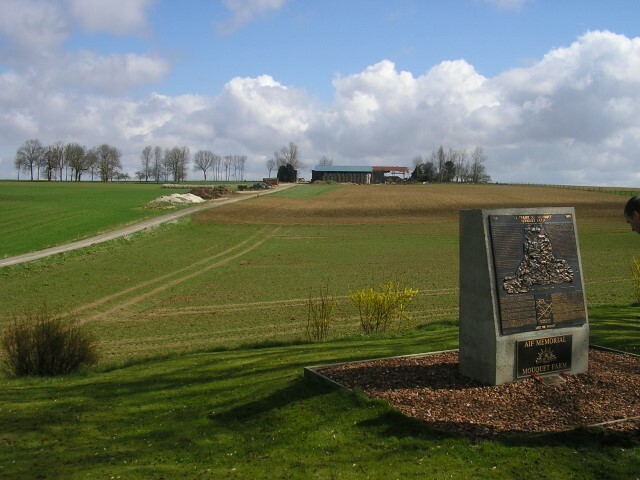 The 32nd and 33rd Brigades were in the vicinity of Nab Valley facing Mouquet Farm on the 15th September 1916. “No significant progress was made in the northern sector in the first few weeks of July. Ovillers, just north of the Albert-Bapaume road, was not captured until 16 July. Its capture, and the foothold the British had obtained in the German second position on 14 July, meant that the chance now existed for the German northern defences to be taken in the flank. The key to this was Pozières. The village of Pozières lay on the Albert-Bapaume road at the crest of the ridge. Just behind (east) the village ran the trenches of the German second position. The Fourth Army made three attempts to seize the village between 14 July and 17 July before Haig relieved Rawlinson’s army of responsibility for its northern flank. The capture of Pozières became a task for Gough’s Reserve Army. Going in shortly after midnight on 23 July, the attack on Pozières was a success, largely thanks to Walker’s insistence on careful preparation and an overwhelming supporting bombardment; however, an attempt to capture the neighbouring German second position failed, though two Australians were awarded the Victoria Cross in the attempt. The Germans, recognising the critical importance of the village to their defensive network, made three unsuccessful counter-attacks before beginning a prolonged and methodical bombardment of the village. The final German effort to reclaim Pozières came before dawn on 7 August following a particularly heavy bombardment. The Germans overran the forward Australian defences, but the Australians emerged victorious. Gough planned to drive north along the ridge towards Mouquet Farm, allowing him to threaten the German bastion of Thiepval from the rear. However, the further the Australians advanced, the deeper was the salient they created such that the German artillery could concentrate on them from three directions. On 8 August the Australians began pushing north along the ridge with the British II Corps advancing from Ovillers on their left. By 10 August a line had been established just south of the farm, which the Germans had turned into a fortress with deep dugouts and tunnels connecting to distant redoubts. The Australians made numerous attempts to capture the farm between 12 August and 3 September, inching closer with each attempt; however, the German garrison held out. The Australians were relieved by the Canadian Corps, who would briefly capture Mouquet Farm on 16 September, the day after the next major British offensive. The farm was finally overrun on 26 September, and the garrison surrendered the following day. In 11th Division, the bombers of the 6th Bn. Lincolnshire Regt. secured all the Constance Trench as far as the Thiepval-Pozieres Road. 6th Bn. Border Regt. captured the western half of Danube Trench. An attempt by the Germans to retake Constance Trench was beaten off. The 6/Lincolns and 6/Borders formed part of the 11th Division’s 33rd Brigade confirming that the area was subject to offensive actions. The 9/Lancs may have been in reserve as warfare continued along the front to the south and there were also actions at Flers, Delville Wood and Ginchy. The 9/Lancs Fusiliers were in the line opposite Mouquet Farm near Thiepval and clearly there was significant action in the line. Private Watkin Smith died 17 September 1916. He has no known grave, the victim of the violence of warfare either machine gun fire, sniping or as most probable enemy artillery shelling. 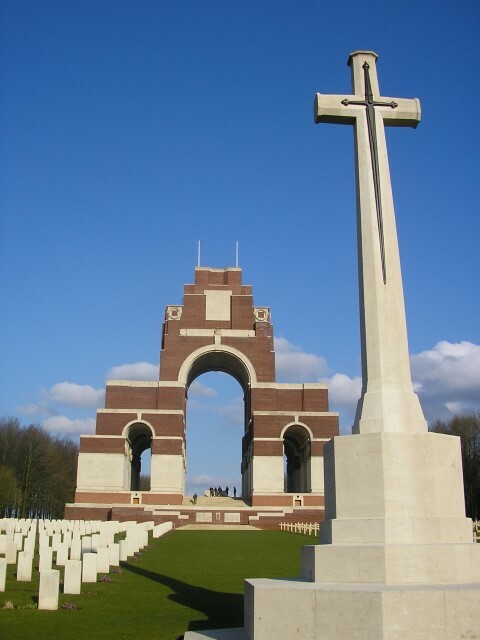 Thiepval Memorial, the Memorial to the Missing of the Somme: The Memorial bears the names of more than 72,000 officers and men of the UK and South African forces who died in the Somme sector before 20 March 1918 and have no known grave. Over 90% of those commemorated died between July and November 1916. 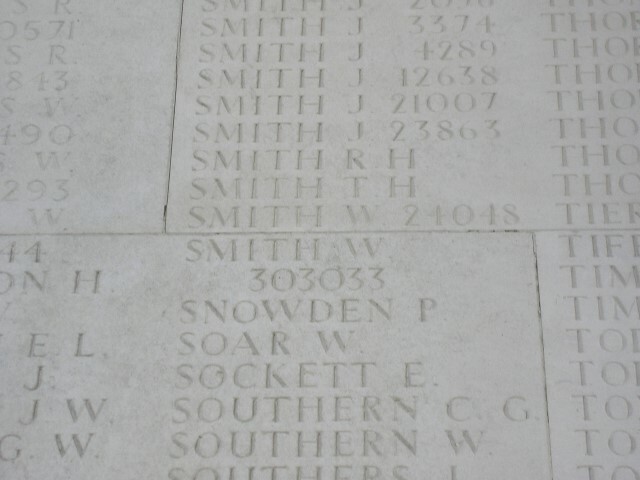 24048 Private Watkin Smith is commemorated at Pier and Face 3C and 3D.